This unique little neighborhood has been a long time favorite of First Time Home Buyers and Real Estate Investors alike. Its location is also somewhat unique, just a couple of blocks from Hwy 72 and 2-3 miles from one of Madison’s major shopping areas. It is located on the Huntsville / Madison city limits (there are some strange boundaries) and is found on the MLS in the Northwest Huntsville Area. The school system supports the neighborhood via the Providence K-8 and Columbia High Schools. 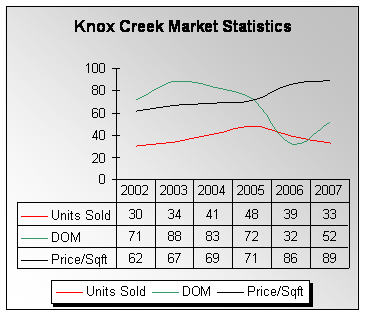 In the following chart you will see a 6 year history of sales and prices explicit to the Knox Creek Neighborhood. In summary the sales rate has slid over last couple of years, while during the same period days-on-market (DOM) has improved and prices have continued to appreciate. The history of price appreciation in the neighborhood is an investor’s dream with an average annual appreciation rate of 7.5% since 2002. While past performance does not guarantee future appreciation rates, the 2008 year-to-date price history indicates a current appreciation rate of 3.3% over last year. Within the neighborhood there are currently 16 Homes on the Market ranging from $85,000 to $129,900. With a seasonal average sales rate of 4 homes per month the current absorption rate indicates a 4 month supply of inventory and thus the neighborhood should be considered a sellers market when contemplating an offer or listing price.